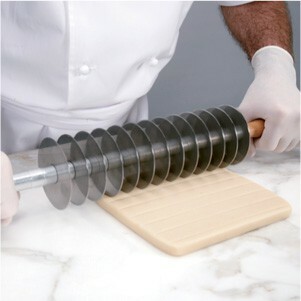 1 Roll the marzipan into a rectangle 3 × 7½ in/80 mm × 190 mm, ½ in/12.7 mm thick. 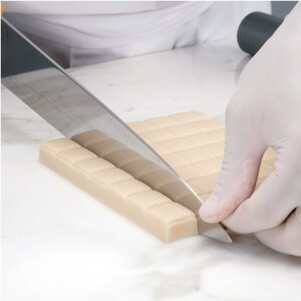 2 Using a caramel cutter or a ruler and a knife, score the marzipan into pieces ×1¼ in/15 × 30 mm. 3 Using the scored lines as a guide, cut the marzipan into rectangles. 4 Dip each piece of marzipan into the tempered couverture only far enough to cover the sides with couverture. Be careful to avoid covering the top surface with couverture. 5 Place each dipped praline on parchment paper. 6 Using a pastry bag, pipe a dot of dark couverture onto each piece and top each with a toasted almond slice or other garnish as desired. 7 Let the chocolates set at room temperature. Store in an airtight bag in a cool, dark place. – Mark the marzipan with a caramel cutter. – Cut the marked marzipan into pieces. 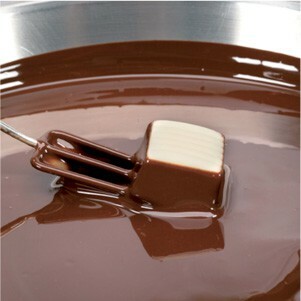 – Dip each piece in the tempered dark couverture, keeping the top level so it does not get covered with couverture.